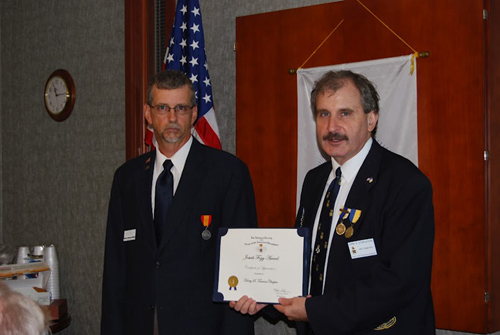 President Dirk Stapleton is shown here presenting a MOSSAR Certificate of Appreciation to Historian Brian Smarker, in recognition of Historian Smarker's hard work and dilligence in preparing the chapter’s 2011 Yearbook. Upon behalf of MOSSAR and the Harry S. Truman Chapter, we wish to congratulate Historian Smarker for this achievement. Photo (L - R): Historian Brian Smarker and President Dirk Stapleton. Not pictured is Compatriot Perry Dean "Bud" Marks who was the Color Guard member participating.